A once in a lifetime trip that sees you cycle some 1000 kilometres along the length of the Carretera Austral, stopping at the most spectacular spots and staying in hostels and camping out under the stars along the way. You will arrive in Buenos Aires and a transfer will be waiting for you with a sign ready to take you to your hostel in Recoletta. There will be no Tour Leader or guide this day, and you will have time to explore or just relax after a long flight. If assistance is needed this day, please ask and we will gladly help. You will have a relaxing morning in Buenos Aires doing as you please. In the afternoon you will need to return to your hostel and prepare to catch an afternoon flight to Bariloche. Once in Bariloche you will be met at the airport and taken to your hostel. Our team will meet with you at the hostel and take you to a welcome dinner! The evening is yours to relax. Today you will have time and assistance to look for any last minute gear or supplies. Our team should have most everything ready, but today is a down day just in case someone forgot something. You can also spend the day sightseeing in Bariloche; it is a beautiful tourist town. We will have a nice dinner and get a good night's sleep before departing for the next day. Today you will take a short 42km ride on a paved road to get warmed up! As we leave the Bariloche area you will pedal around Cerro Otto. Shortly after the city is behind you, you will be able to see the impressive Tronador Mountain, Villa Catedral, and Lake Gutierrez. You will spend the night camping in National Park Nahuelhuapi. You will ride for a total of 82 km on paved roads today. We begin in the morning after a delicious camp breakfast! We will have amazing views of Lake Guillelmo and various valleys as we pedal south on an undulating road. As we arrive inside the valley, we will stop for lunch at El Viejo Almacen, an old restaurant on the road. During the last 42 km the landscape will be similar to that of the Alps and you will see that pine forests cover the mountain ranges. In the evening you will arrive at El Bolson and spend the night in a Hostel; El Bolson is well known for their local brewery, which makes a good stop for an end-of-day celebration. Today you will ride only 40 km along paved roads. In the afternoon we will arrive at a small and relaxing village near Lake Epuyen. This area of Argentina is well-known for the great quality of their berries. You will have to try some for dessert or a snack after your day cycling. We will spend the night in Epuyen in a local hostel. Today, you will finally begin peddling on the famous gravel roads of Patagonia. You will ride for a total of 52 km; the first 30 km are paved, but the last 22 km are on a well compacted gravel road. During the ride we will pass by Butch Cassidy's house and be able to think about how his life was in the wilderness many years ago. Finally we will pass Cholila; our next destination is just past the small town. We will stay in a beautiful hosteria and unpack. We will have the evening to relax and spend time preparing for our rest day near Los Alerces National Park. Today you can take it easy, go for a hike in the nearby national park, or spend some time fishing in the great Lake Rivadavia. Today's ride is a bit long, 100 km, but you should be rested. During first section of our ride you will enter Alerces National Park on gravel road. In the park you will be able to admire the enormous Alerce trees and enjoy the views of Lake Rivadavia, Lake Futalaufquen and Laguna Verde. We will prepare a picnic lunch inside the park. Shortly after leaving the park, the road becomes paved and remains this way until we reach Trevellin, In Trevellin we will stay the night in a comfortable hostel. Today we will have a nice relaxing ride of 45 km on both gravel and paved road. As we approach Futaleufu we come to a beautiful valley. In the valley we will need to cross the border from Argentina to Chile. Just a bit past the border we will finally reach Futaleufu; it is a slightly bigger than the other towns we have seen and will see in the near future. So, tonight we will enjoy the commodities of a medium-sized town. In the morning we will load the support vehicle with our gear and our bikes. Today we will let our legs take a break and give our arms a workout. 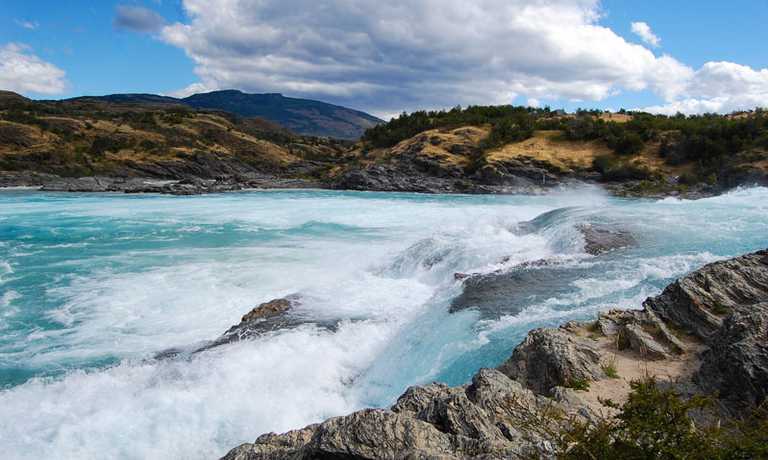 We will raft down the famous Futaleufu River! The ride is completely safe and guided, you will be provided with the gear needed for the day and be able to enjoy a different mode of transportation. We will arrive in the afternoon at a base camp on the shore of the river. Today we will spend the night at the base camp. Shortly after a hearty breakfast at the base camp, we will head out for a 70km ride on gravel roads towards the Lake District in Chile. The region is amazing and we will have the opportunity to relax by the Lake Yelcho. You will spend the night in a hotel tonight and enjoy the scenery as the sun sets. The day is yours today. You can choose if you would rather spend time relaxing in the hotel, on the lake, perhaps fishing, or go to Pumalin National Park for a nice hike. In the morning we will leave for a nice 88 km ride all on gravel road. We will ride in a van the first 20 km in order to start from Villa Santa Lucia. The trip would be over 100 km, but the short ride in the van will help you to have energy and enjoy your time cycling in the morning. Your ultimate destination today is Lago Verde Valley, near Lake Rosselot. The ride is long and difficult today, but the views and experience really make the ride worth it. Lago Verde Valley is great for fly fishing and when we arrive you can try to catch something in one of the nearby rivers or lakes. Today we will have a bit of an easier ride. We will ride approximately 66 km on gravel roads, crossing both the Rosselot National Forest and Lake Risopatron. In the afternoon we will stop in Puyuhuapi for lunch. The town is near Queulat National Park. In the afternoon a boat from a nearby hotel will pick us up and take us to their hot springs. We will relax and enjoy the evening in luxury! Today we will enjoy the breath-taking landscapes by trekking in the nearby national park. However, if you like you may relax in the hot springs and take a day just for yourself. We will start out early today after a day of rest. We will go 91 km, so hopefully we are well rested! Today we will ride across the famous Queulat pass; it has approximately 33 switchbacks until reach 1600 feet above sea level. When we finally reach the top, we will go downhill until we find a paved road and be able to peddle into Villa Amengual a bit more quickly. However, we won?t stop in the city, we will continue until arriving at Lake Las Torres, where we will stop for the day in nice fly fishing cabins. We will wake to have breakfast in the cabins and prepare to ride. We will be peddling 53 km from Villa Amengual to the small town Maniguales. The road is mixed with both paved and gravel sections. The views are amazing; we will see valley lined with towering peaks, canyons and rivers. We will stop for lunch in Ma?iguales and then continue to the next town by bus. It is approximately 64km to Coihaique, which is the biggest city in the region and the commercial center for this part of Patagonia. We will spend the night in the town and you will have the opportunity to explore and enjoy "city" life again. You will be able to take it easy this morning. We will leave after lunch because the ride today is short and fairly easy, we will ride just 40 km on paved road to El Blanco. The town was a post for travelers and populated by farmers. There are just 500 people that live in the town today. In the evening you can take it easy and if is not windy you can cast a line into Elizalde River. We will sleep an old farm house that has recently been remodeled and experience the relaxed life of the locals. In the morning we will have a country style breakfast with lots of homemade bread and fresh jam. We will begin peddling shortly after breakfast and our ultimate destination today will be Villa Cerro Castillo. It is approximately a 64 km ride on paved roads. This will leave you time to enjoy the beautiful route and the small populated areas along the way to the village. You will spend time in the evening deciding what you will do during the next two days where are allotted for rest time or for exploration in the Reserva Villa Cerro Castillo. Depending on the decisions from the previous day we can plan a short two day circuit hike in Reserva Villa Cerro Castillo and get a bit further into the wilderness or you can stay in the small town and relax. There are some ancient wall paintings that you might also be interested in visiting. The day is yours, so you will continue the activities that you decided on from the previous day. We will start out very early today, because we are going to have a big riding day. Breakfast will be at 7:30 and we will leave before 9:00, the first 50 km of the day will be ridden in a transfer. We will get out of the transfer and continue our way on our bikes. The ride is on gravel and we will continue peddling past beautiful lakes, rivers, and through valleys until we finally reach Puerto Murta. We will spend the night in the tiny town and rest after a long day. To make up for yesterday, today will be extremely slow. We will have a late departure and ride 23 km on gravel road to Puerto Tranquilo. This small port town is our next base to relax and enjoy Patagonia. Lake General Carrera is the largest lake in Chile and we will spend some time seeing it. You will also want to make time to see Exploradores Glacier and San Valentin Mount and ice field; both bodies of ice contribute to the northern ice field. We will take a trip out to Lake General Carrera National Reserve and kayak through amazing marble caverns. The views from inside and outside of these caverns is absolutely breathtaking. Today you will have the opportunity to see another spectacular place. In the morning we will depart towards the national reserve and this time we will hike towards Exploradores Glacier. We will reach a viewpoint and be able to enjoy the views of the northern ice field and also of San Valentin Mount. In the evening we will return back to Puerto Tranquilo to spend the night. Today we will leave the peace of Puerto Tranquilo and head towards to Puerto Bertrand, a place where the famous and amazing Baker River starts. Along the route we will pass three lakes, during the summer months the lakes will rise and flood a lot of the area?s farmlands. We will ride 78 km on gravel roads and cozy cabins will be awaiting us in the evening. The town is a great place for fly fishing and we may encounter serious fishermen in this town. After a nutritional breakfast we will begin cycling along Baker River. You will be able to relax and admire the impressive rapids along the way. We will ride 62 km on gravel road, and cycle over a couple of demanding stretches as we head towards another bigger town. We will stay in a cozy hostel in Cochrane. This is the last town we will stop at with internet and telephone connection. After today we will be entering some of the most untouched places in Patagonia. Outside of Cochrane you can find San Lorenzo Mount, this is one of the highest peaks in the region (12,158 ft) and on a clear day you can see it in the distance. We will spend the night in Cochrane before delving further into Patagonia! Today we will leave the peaceful camp and get back on the road. Our destination today is called Caleta Tortel; it is 97 km, along gravel roads, away from Camping Los Nadis. It is an incredible town built on steep stone cliffs and until 2003 was only accessible by water. Today the town is connected via boardwalks and when you arrive you will have to get a boat-taxi or walk along the boardwalks for about 30 minutes until reaching our final destination in a cozy hostel. During our rest day we will have the opportunity to visit Jorge Montt Glacier. We will enjoy a day trip by boat to see the northern portion of the Southern Ice Fields, which is the third largest fresh water reserve in the world. In the evening we will return back to Caleta Tortel and have another good night?s rest. We will need to start out early today because the journey today is 155 km on gravel roads and on water. We will begin the day by taking a transfer to Puerto Yungay where we will board a boat. This ferry will save us some distance peddling and also make the last leg of our adventure on the Carretera Austral more interesting! 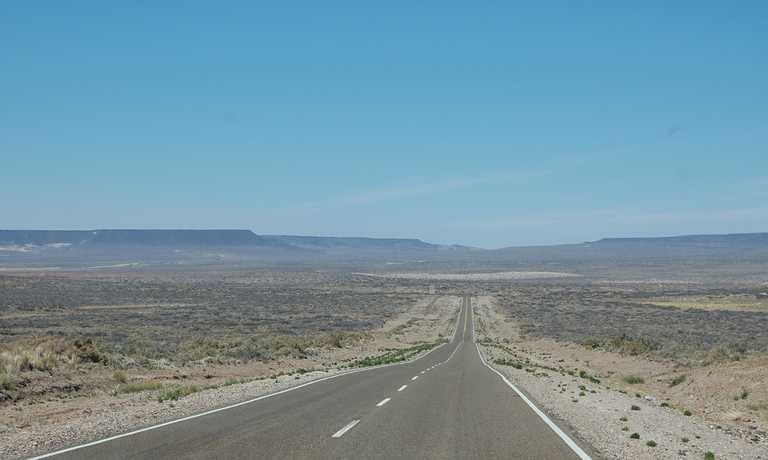 We will head towards Villa O'Higgins after the ferry crossing docks in Rio Bravo and have 92 km to go on gravel roads. Finally we will arrive in Villa O?Higgins and prepare for the crossing the following day. Today we will begin our voyage across Lake O'Higgins and Lake San Martin. First we will have breakfast and be prepared to cross the ferry. We will have to ride 15 minutes down a gravel road and then board a ferry that will take us two and a half hours across Lake O?Higgins to Candelario Mansilla, where we will stop and enjoy the life of this remote Estancia for the evening. We will eat dinner here and sleep under the stars in tents. Today will be a bit longer than the day before. We will begin the day hiking/cycling four to six hours on a trail that isn?t maintained very well; the distance is only 22 km. It will be difficult, but will add an aspect of true adventure and wilderness to your ride. Finally you will read Lago Del Desierto and be able to rest at camp. 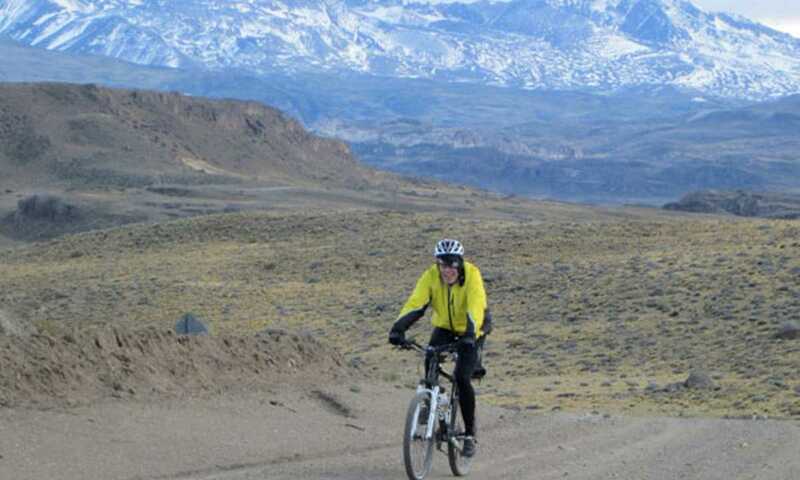 Tomorrow will be our last day cycling and you will have finished your journey peddling through Patagonia. In the morning you will board another boat that will take you across Lago del Desierto to a road that leads to El Chalten. As you ride into town you will notice the amazing peaks that made this area famous. On a clear day you will see Fitz Roy towering above the town. It is a short 40 km ride to El Chalten and we will arrive in time for a shower and some time to explore the town before we settle in for dinner. Today you can spend the day for yourself. You can take a short walk out of El Chalten or just relax in the quaint little town. We can also arrange for a guided tour this day if you wish. Today we will have time to take a hike through the mountains. We can pick from various hikes depending on the weather and what the group wants to do. The most well-known hikes in this area include Lago de los Tres and Cerro Torre. Today we will have the chance to walk on Glacier Viedma. After seeing so many glaciers we will finally take a hike on one. We will return to El Chalten in time to catch the bus to El Calafate and spend the night there. El Calafate is a nice town; it will be the biggest place you have been to since Coihaique. You will have time to see the famed Perito Moreno Glacier today or tour around the city. There are some other interesting tours to indigenous wall paintings or four wheeler trips. We will have our celebratory dinner and say farewell to each other, before heading back to our hostels to pack and prepare for our journey?s home. Depending on your flight from Buenos Aires is what time you will leave El Calafate, I suggest you leave earlier in the day so you will have plenty of time for your connection in Buenos Aires. You will have breakfast in El Calafate and then be taken in a transfer to the airport.